The manufacture & use of various forms of fine textile varieties can be traced back to the Indus Valley period. Due to the short life of the textiles, the only evidences are the paintings, sculptures & inscriptions if any. The images in the paintings & sculptures are seen draped in fine transparent muslin. In fact, in most paintings the fineness of the cloth is stressed by highlighting only the hem and folds of the dress. There are clear evidences of the variety of textiles and embroidery in the Ajanta murals & miniature paintings, temple murals. The art of weaving and dyeing cotton had been well developed, but silk weaving came later. The art was practised from 1st century and by the 4th & 5th century, woven silk formed a major portion of exports. Textiles were the major attraction that formed the bulk of the trade with Western and Eastern countries. Roman documents mention the export of silk from India to Europe around the sixth century A.D. Masulipatnam on the western coast was an important port, with traders coming in from China, Arabia & European countries like Portugal, France and England. Textile trade was carried on in the North, with caravan loads of woven textiles reaching Moscow. The Moghul Emperors with their flair for beauty and luxury brought in new skills which mingled with the existing art, resulting in fine artworks. The textile trade that had started diminishing with lack of strong Moghul rulers, totally came to a standstill with the Industrial Revolution in England. In their attempt to sell their wares, India was used as a dumping ground for their cheap machine made textiles. Indian master weavers were out of jobs. 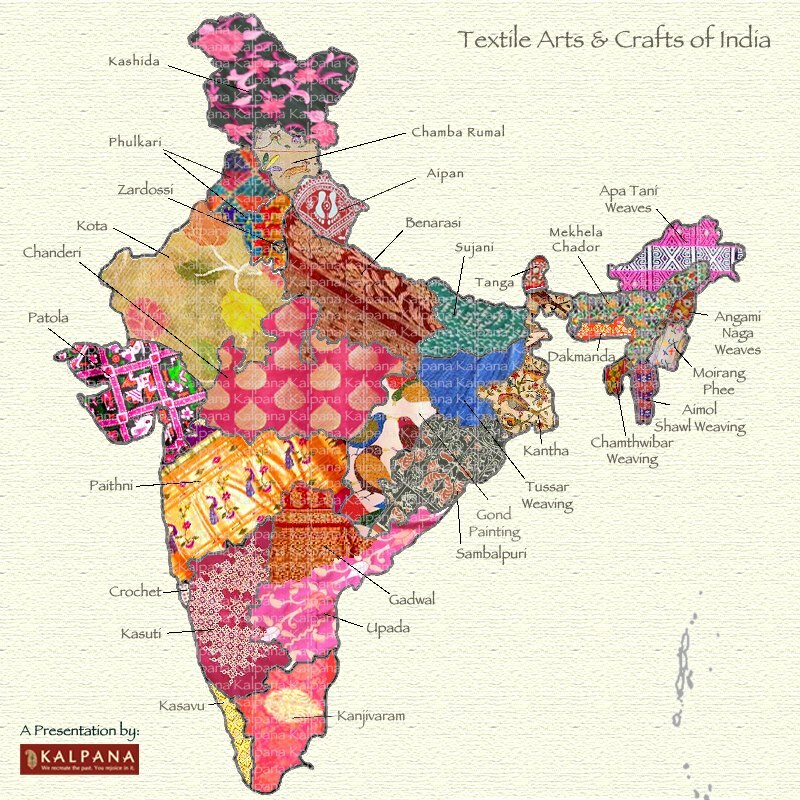 The Swadeshi Movement stressed the need for use of the hand crafted Indian textiles, both to preserve the craft forms and also to protect the interests of the Indian craftsmen. After Independence, efforts were made to revive the industry. In 1952, the All-India Handicrafts Board was set up, with Smt. Kamaladevi Chattopadhyaya as the chairman. The conditions were so pathetic with little or no information available easily. Several programmes were launched to retrieve some samples, to create an awareness amongst the public, to learn again to appreciate the fine intricate art forms of our country. All their efforts have paid off and today there is a great recognition, thanks to their efforts, for the Indian textiles in India and abroad. Heritage of the Loom - from "Homage to Rukmini Devi"
Kalpana, Delhi have put together a window into the world of Textile showcasing a microcosm of the various Textile Arts & Crafts across our India. Ayurvedic Textiles are made using natural fibers and dyed with medicinal rich herbs. Ayurvedic fabrics are not only eco-friendly but also give wellness or positive energy to skin. The process is unique from pre-processing to dyeing as only natural herbs and plants are used for all the process - natural gums are added to fix the properties of the herbs by infusion method. All the fabrics will have an energy and you can feel by using it. GOTS certified fabrics are used and fabrics have normal standard fastness. Customers are assisted to conduct the required test on the fabrics. Register to participate, visit the facility to understand more about the process. Manufacturer and wholesaler of pure vegetable print kalamkari sarees, fabrics, dress materials, kurtis, patch work kurtis and sarees, shawls, bedsheets, table cloths, door curtains, wall panels - non chemical and easy to maintain, long lasting and color fast.